I want to ask how you are, what you’re doing, where you are, if the wind is blowing (like it is here), if there’s rain or perpetual sun, if there’s even a sky (as we know it). So many questions. Do you remember these lyrics? What a day for a daydream / What a day for a daydreamin’ boy. They popped into my thinking while picturing you taking it easy, laying on your side in the yard, one hand propping your head, the other spinning a stem with a dandelion sphere of seeds on the top. And I’m lost in a daydream / Dreamin ‘bout my bundle of joy. I guess that’s where I am, Alsie—lost in a daydream, imagining you diddling time away, a perfect world of tiny seeds at your disposal, seeds with tiny beginnings of green and more green. Perhaps an odd way to start a letter, then again, maybe not. 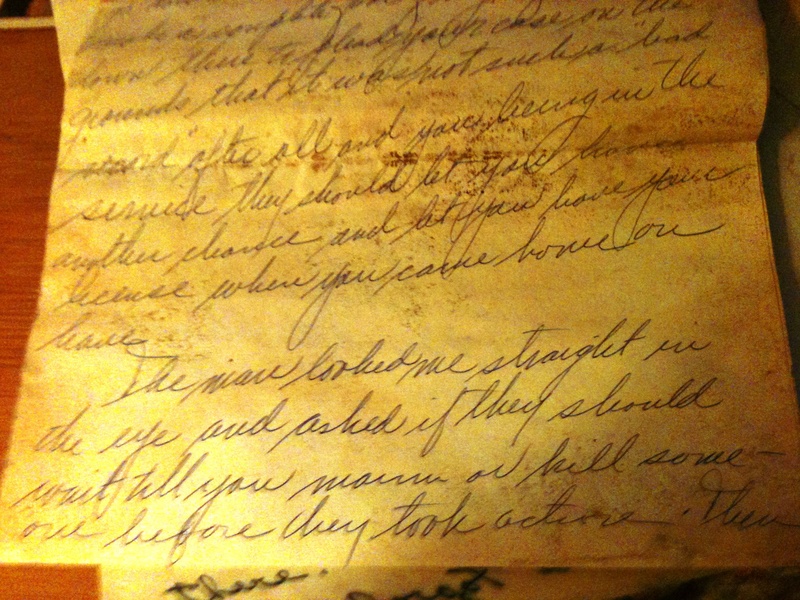 The letter I read from you today dealt with a time when you were, hmm, how to say … ? I’ll let you say it: I sure feel like raising hell, but I know if I mess up I’ll really be in big trouble. I don’t think I’ll be able to control myself. I feel like getting drunker, causing more trouble and raising more hell than I’ve ever done before. That’s going to be a mighty big parcel of goofing off. I hope I don’t go to jail. Postmarked “Camp Pendleton, Nov. 22, 1965”, the envelope held news that you were not a happy camper in ITR training, and that you, Larry and Tom would be attending MP school and not going overseas immediately. Addressed to Miss Lynn Due, 6536 Etiwanda Ave., Mira Loma, Calif., the letter found me still living with Mama and Daddy. Carolyn lived with us, too. We hadn’t moved into the studio apartment overlooking Riverside City College at that point. We would. I’m not sure when—but we would—desirous as we were of becoming “The” social hub of Riverside County. She was flabbergasted (to use a word I frequently run across in your letters). I don’t think she’d received a dozen roses from anyone—ever. You knew how to win the hearts of women. Well on your way to winning mine, you won hers in that instant. While it was a first for me, finding a suitor at my door with a huge array of roses, it wasn’t the first bouquet between us. You’d had flowers sent, a dozen red roses, to the office where I worked afternoons. I was still in high school, a senior, working the Riverside County Schools switchboard from one until five. We’d had our first date on a Wednesday night; on Thursday afternoon red roses arrived to occupy a good portion of the switchboard/reception area counter; the card read: Can hardly wait for Friday. See you then! Al. Yep. You had a way of sweeping a country girl—two country girls, me and Mama—off our feet. On the day of the yellow roses delivery, you softened the blow by saying, “There’s something for you in the car.” I’ll say there was! A plush white rabbit so large he took up half the back seat of your ’57 Chevy. Pink satin inside his huge floppy ears. White fur so thick and deep fingers disappeared when I stroked him. I named him Leon, after you, Mr. Alphonse Leon Doiron. He became my bed partner. He was a lovely friend. 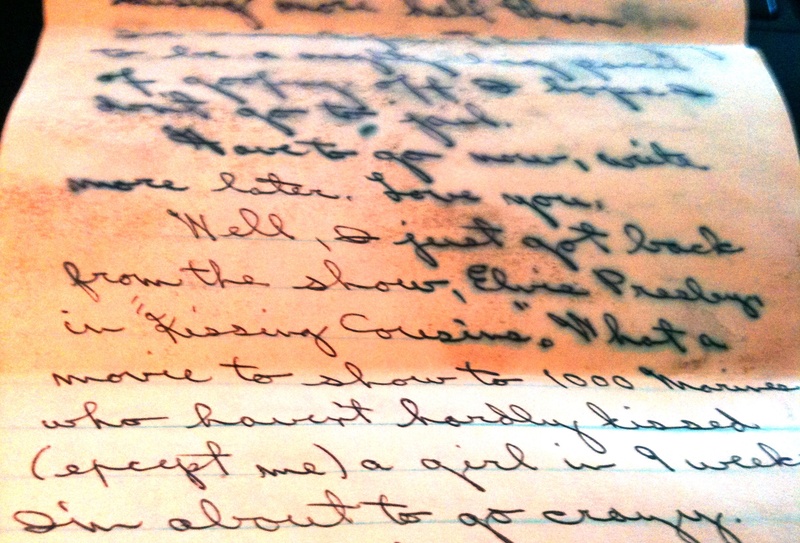 I seem to have gone a little off track with this response to your November 22, 1965 letter. Your fault for writing Howdy Mrs. Due on the back. I have to agree with you regarding the Corps choice of movies. Honey, I felt so bad that your mom made you feel rotten with some stupid letter. 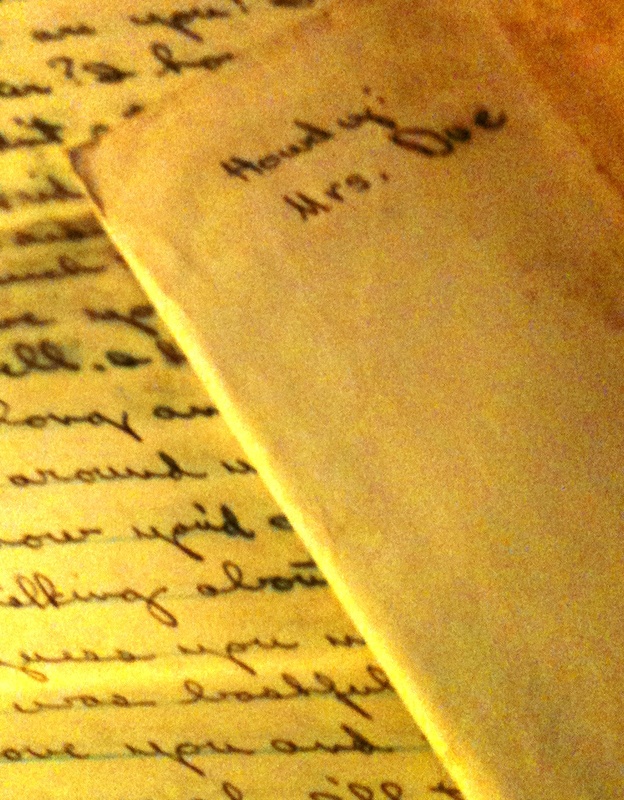 Then I read her letter. Oh my. She was full of righteous anger. I don’t know if you can read what she wrote; the last paragraph says: The man looked me straight in the eye and asked if they should wait till you maim or kill someone before they took action. The “man” was the DMV clerk she had appealed to, on your behalf, for reinstatement of your drivers license. The “man” had shown her your records, the volumes of violations you’d been cited for, the fines you owed (in excess of $300—no small amount in 1965). She was “struck dumb” to hear you’d spent six days in jail; were on probation in Fresno and Bakersfield; and wouldn’t, under any circumstances (according to the “man”), be allowed a drivers license until a year after your enlistment ended. As it turns out, according to your mom’s letter, you’d been turned down for the draft (unbeknownst to you) due to traffic violations and there was some question as to whether or not the Marine Corps would keep you once your record became known to them. On page 2 of her five page tirade, she writes: Al you have always been my favorite but you’re sure killing a lot of it fast. One mess after another since you were 14 and it’s got to stop. You cannot enter adulthood with that devil-may-care attitude. I can’t help it, Alsie. I have to say: “Well said, Mrs. D!” Of course I’m responding to her advice from an age slightly older (nine, ten years?) than she was at the time she sent you this blistering mail. Perspectives change. In 1965 you were a rascally hellion; I was a Mira Loma girl—rural to the max—and determined I’d go to college. That song I mentioned earlier … I’ve been trying to remember who sang it and I think it was the Lovin’ Spoonful. It was one of those songs made you want to whistle along with the tune. I think it had whistling in it. These days with computers and the internet you can find anything. I googled (another new word for you—one I think you probably like because it sounds a little like goofy, a word you used more than once back in the day) the lines of the song I could remember, and came up with a few more lyrics. And fall on my face on somebody’s new mowed lawn. Now I’m wondering which came first: the tune playing inside my head or imagining you twiddling that dandelion stem. Either way, you need to know you’re the guy on the grass admiring the complexities of a seed cluster, easy with the world (in my remembrances)—not the hell-on-wheels guy looking for trouble. You’re the guy with the roses for Mama and the rabbit named Leon for me. You’re the guy, Alsie, who made my life full and fun. I loved this. It had more fun in it and more love for Al. Maybe that’s what kept me from commenting on the previous letter – It didn’t seem to flow from your heart the way this one did.